Norfolk Broads Yacht Club maintains a high standard of sail training, power boat courses and mentoring for members and non-members throughout the year, running both mid-week & weekends. There is something for all ages & abilities. We also have club boats available to hire: three Yeomans, Toppers, Optibats and a Wayfarer. Please contact the Office first if you wish to use one. The “link to forms” will give you more information about each course as well as the booking form. We are also available to offer one to one tuition and “own boat training” – please call the Office on 01603 782808 – or email us at training@nbyc.co.uk for more information and to book. 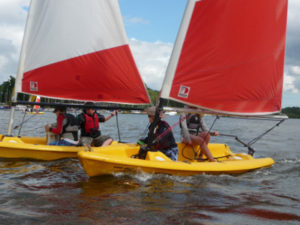 NBYC Sailing School – 2019 Courses.